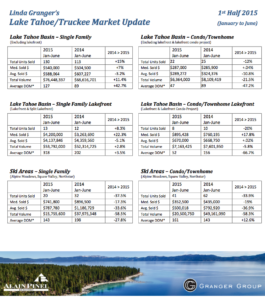 Home > Tahoe-Truckee Market Report is out! The bright spots: single family residential sales in the north and west Tahoe Basin are climbing, Truckee condos and townhome prices are up, and the luxury market on the big lake is seeing some growth. Incline saw a healthy rise in total volume on condos. SFR’s from Rubicon Bay to Kings Beach are posting a 15% jump in units sold over last year, resulting in an 11.4% hike in total volume. Now for the snow farmer’s almanac (close your eyes if you’re squeamish): total volume in both SFR’s and condo/townhomes in the ski resorts–Alpine, Squaw, and Northstar combined–plummeted more than 58% as compared with 1st half 2014. Average prices are down by a third. But…forecasters are predicting an El Nino year and we may just see a banner ski year in ’15-’16! For those who would love to see prices get back to the peak in ’05-’06, we’ll have to wait a little bit longer. For the whole Tahoe Sierra MLS, average price is still down about 28% from 1st half 2006. However, 3rd quarter always thrives in Tahoe and I’m confident that we’ll see some great numbers! Contact Me with any questions about Tahoe-Truckee real estate!